Lonnie Wheatley, HAUBSTADT, Ind. 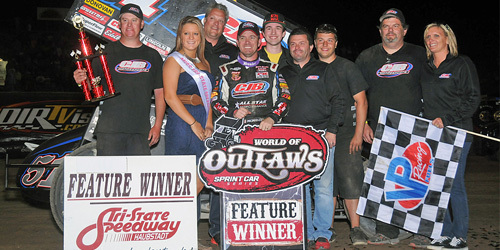 (May 3, 2015) – Brady Bacon was ever-so-close to capturing his first World of Outlaws feature win on Sunday night at Tri-State Speedway. But one or two too many cautions proved to be his undoing, as Paul McMahan raced into the lead on a lap 33 restart and paced the final eight circuits to pick up his second series score of the year in the 40-lapper. Starting inside the second row, McMahan spent the early rounds chasing Bacon and Rico Abreu. Bacon, who was looking for his second Haubstadt win in the past three weekends after a recent wingless USAC score, beat Joey Saldana into the lead at the outset and then fought off some early restart challenges from Abreu. Abreu was nixed from the picture after 13 laps though when he got upside down after a tangle in traffic that moved McMahan into second. McMahan kept the pressure on the reigning USAC National Sprint Car champion from Broken Arrow, OK, with challenges on each restart. Following a quick red flag for Shane Stewart after 32 laps, McMahan got the restart he needed and took command when Bacon nearly took out a portion of the turn four wall. McMahan raced to the win following one final yellow flag with three laps to go, taking the checkered flag ahead of Bacon while Joey Saldana claimed third-place for the second night in a row. After starting 20th, Donny Schatz snuck through the field and was among the top five by the 27th round. Schatz tried to mix it up with the lead trio but had to settle for fourth with Kraig Kinser rounding out the top five. Quick Time: The best was saved for last with final qualifier Shane Stewart setting the quick time of 12.037 seconds. The 11-year-old track record of 11.11 seconds set by Sammy Swindell still stands tall. Heat Winners (starting position in parentheses): Paul McMahan (3), A.J. Bruns (1), Brady Bacon (3), Aaron Reutzel (1). Heat Moments: Steve Kinser pulled to the pits with problems before the first heat but made it back out when a false start was called on pole starter Christopher Bell, who was docked a row. McMahan went on to take the win while fast qualifier Stewart missed the transfer; Heat two featured some lively sliders between Chili Bowl teammates Brad Loyet and Gary Taylor as MOWA shoe A.J. Bruns picked up the win; Brady Bacon battled past Jamie Veal at the midway point en route to winning heat three; Aaron Reutzel outgunned Paul May at the drop of the green flag and went on to win his first career WoO heat race. “B” Main Winner (starting position in parentheses): Shane Stewart (1). “B” Main Moments: The only caution flew after 7 of 12 laps when Kerry Madsen slid to a stop with front end damage after contact with Greg Wilson while dicing for the fourth and final transfer. Madsen opted for a provisional to take part in additional cautions in the “A” Main. Sixth on the restart with five to go, Sammy Swindell battled his way into fourth. Lap 6 – Kerry Madsen spins in turn one. Lap 7 Restart – Red flag when several cars get jumbled up in four including Chad Kemenah, Shane Stewart and Parker Price-Miller. David Gravel and Madsen both made quick trips to the work area as only Kemenah was done. Lap 13 – Second-runner Rico Abreu flips in turn two after tangling with the lapped Madsen. Rico was not pleased. Lap 27 – Madsen turns it around in turn two. Lap 28 Restart – Tim Kaeding spins in turn two after working his way from 18th to seventh. Lap 32 – A quick red flag when Shane Stewart gets into the turn two wall and tips over on his side. A quick tire change had Stewart back in the mix. Lap 37 – Kyle Hirst is facing the wrong way in turn three while Madsen stops on the frontstretch with left front damage. The night of Madman madness is done. “A” Main Hard Charger: Donny Schatz worked his way from 20th to fourth and was in the mix over the final circuits. Brad Sweet gained 16 positions as well with a run from 22nd to sixth. Qualifying: 1. 2-Shane Stewart 12.037, 2. 05-12.046, 3. 11k-Kraig Kinser 12.057, 4. 24-Rico Abreu 12.079, 5. 51-Paul McMahan 12.089, 6. 71m-Joey Saldana 12.101, 7. 99-Brad Bacon 12.130, 8. 10h-Chad Kemenah 12.162, 9. 9p-Parker Price-Miller 12.190, 10. 1st-Gary Taylor 12.210, 11. 7-David Gravel 12.238, 12. 71mx-Paul May 12.250, 13. 67-Christopher Bell 12.307, 14. 2b-A.J. Bruns 12.333, 15. 41-Jamie Veal 12.345, 16. 87-Aaron Reutzel 12.375, 17. 7s-Jason Sides 12.375, 18. 3-Tim Kaeding 12.444, 19. 23-Jimmy Light 12.448, 20. 1s-Logan Schuchart 12.457, 21. 15-Donny Schatz 12.460, 22. 9-Daryn Pittman 12.479, 23. 49-Brad Sweet 12.494, 24. 83-Kyle Hirst 12.500, 25. W20-Greg Wilson 12.501, 26. 6-Bill Rose 12.505, 27. 29-Kerry Madsen 12.550, 28. 01-Sammy Swindell 12.555, 29. 11-Steve Kinser 12.588, 30. 20n-Hunter Schuerenberg 12.597, 31. 4-Danny Smith 12.639, 32. 11n-Randy Hannagan 12.654, 33. 51b-Joe B. Miller 12.749, 34. 4k-Kody Kinser 12.825, 35. 14T-Jimmy Bridgeman 12.836, 36. 1a-Jacob Allen 12.962, 37. 7m-Critter Malone 13.085, 38. 7h-Jojo Helberg 14.670. Heat One (10 Laps): 1. 51-Paul McMahan, 2. 15-Donny Schatz, 3. 9p-Parker Price-Miller, 4. 67-Christohper Bell, 5. 7s-Jason Sides, 6. 2-Shane Stewart, 7. 7m-Critter Malone, 8. W20-Greg Wilson, 9. 51b-Joe B. Miller, 10. 11-Steve Kinser. Heat Two (10 Laps): 1. 2b-A.J. Bruns, 2. 71m-Joey Saldana, 3. O5-Brad Loyet, 4. 9-Daryn Pittman, 5. 1st-Gary Taylor, 6. 3-Tim Kaeding, 7. 20n-Hunter Schuerenberg, 8. 6-Bill Rose, 9. 4k-Kody Kinser, 10. 7h-Jojo Helberg. Heat Three (10 Laps): 1. 99-Brady Bacon, 2. 41-Jamie Veal, 3. 7-David Gravel, 4. 49-Brad Sweet, 5. 11k-Kraig Kinser, 6. 29-Kerry Madsen, 7. 23-Jimmy Light, 8. 4-Danny Smith, 9. 14T-Jimmy Bridgeman. Heat Four (10 Laps): 1.87-Aaron Reutzel, 2. 71mx-Paul May, 3. 10h-Chad Kemenah, 4. 24-Rico Abreu, 5. 83-Kyle Hirst, 6. 01-Sammy Swindell, 7. 1s-Logan Schuchart, 8. 11n-Randy Hannagan, 9. 1a-Jacob Allen. “B” Main (12 Laps – 4 Advance): 1. 2-Shane Stewart, 2. 3-Tim Kaeding, 3. 1s-Logan Schuchart, 4. 01-Sammy Swindell, 5. 20n-Hunter Schuerenberg, 6. W20-Greg Wilson, 7. 11-Steve Kinser, 8. 7m-Critter Malone, 9. 4-Danny Smith, 10. 1a-Jacob Allen, 11. 23-Jimmy Light, 12. 11n-Randy Hannagan, 13. 7h-Jojo Helberg, 14. 51b-Joe B. Miller, 15. 14T-Jimmy Bridgeman, 16. 4k-Kody Kinser, 17. 29-Kerry Madsen, 18. 6-Bill Rose. “A” Main Finish (40 Laps): 1. 51-Paul McMahan (3), 2. 99-Brady Bacon (2), 3. 71m-Joey Saldana (1), 4. 15-Donny Schatz (20), 5. 11k-Kraig Kinser (5), 6. 49-Brad Sweet (22), 7. O5-Brad Loyet (6), 8. 7s-Jason Sides (17), 9. 1st-Gary Taylor (12), 10. 71mx-Paul May (14), 11. 9-Daryn Pittman (21), 12. 87-Aaron Reutzel (7), 13. 01-Sammy Swindell (24), 14. 7-David Gravel (13), 15. 2-Shane Stewart (9), 16. 67-Christopher Bell (15), 17. 2b-A.J. Bruns (8), 18. 83-Kyle Hirst (23), 19. 41-Jamie Veal (16), 20. 29-Kerry Madsen (25), 21. 3-Tim Kaeding (18), 22. 1s-Logan Schuchart (19), 23. 9p-Parker Price-Miller (11), 24. 24-Rico Abreu (4), 25. 10h-Chad Kemenah (10). Lap leaders: Brady Bacon 1-32, Paul McMahan 33-40.